Printers have shrunken dramatically in size since the days of the first inkjets, but they are still unattractive boxes that we have to deal with. 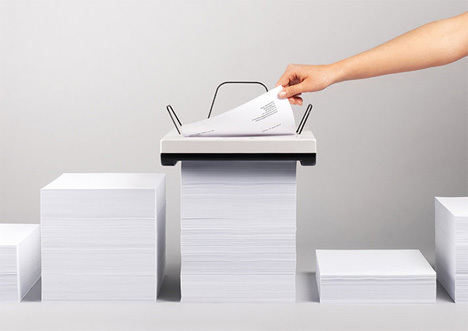 To add insult to injury, there are so many things that can go wrong with a printing job – paper jams, ink smears, a total refusal to do the one thing it’s supposed to do – that office workers genuinely hate having to use this unfriendly piece of office equipment. 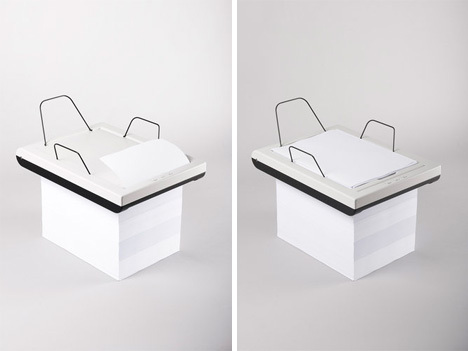 Design graduate Mugi Yamamoto came up with a simpler and more fun design for his diploma project. It’s called Stack, and instead of feeding paper into a little tray over and over, you set the whole machine on top of a big stack of paper. As you print, the Stack feeds paper through the bottom and spits out your finished projects onto the top, creating a new stack. 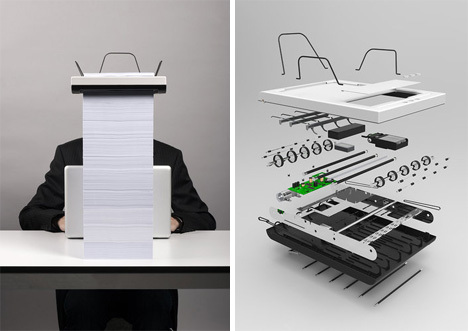 While Yamamoto’s goal was to create a functional and less ugly printer, the machine is also surprisingly entertaining. As it eats its way through papers, you have to wonder whether the stack of paper is going to tip over and spill printer guts everywhere. For those of us who have ever felt the need to go all Office Space on an inkjet printer, this new idea could prevent a lot of appliance-based violence.